She even wrote a postcard to herself from the movie star, promising to marry her. 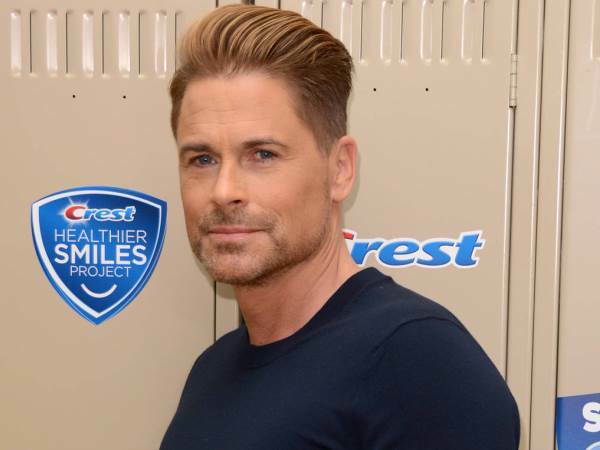 Rob Lowe was flattered to learn Kate Beckinsale once had a teenage crush on him because she's one of his favourite actresses. The Brit recently confessed on Instagram that she was madly in love with the St. Elmo's Fire heartthrob and even wrote a postcard to herself from the movie star, promising to marry her. "EITHER I was a really tragic 13-year-old with time on my hands OR Rob Lowe was all kinds of casual proposing marriage via a postcard of himself, signing his last name AND drawing a d**k instead of using a stamp," she said of the note she found "at my mum's house". Lowe was asked for his thoughts on the big reveal at the premiere of his new film How to be a Latin Lover and told Entertainment Tonight he was thrilled to be Kate's crush. "So amazing," he said. "She’s one of my favourites. That made my day... What’s great about this business is you wake up one day and you go, 'Wait, this really happened, amazing." But Rob has no desire to find out if newly-single Kate is still interested in the 53-year-old actor - he has been happily married to his wife, Sheryl Berkoff, since 1991. The former The West Wing star's family recently treated Rob to a trip back in time when they planned a visit to the house where he filmed The Outsiders in 1982. "It was amazing," he explained. "I mean, I was younger than my boys are when I went and did that movie, and it brought all kinds of memories back. It would be like going back to your college dorm and walking through the hallways, and going, 'I remember what happened here'."